A definitive moment of Saturdays match at Old Trafford came moments before half time. Having fell behind moments before, Stoke played a ball into the Man Utd area. The ball dropped slightly behind Walters who couldn’t manoeuvre the right angle or body shape to get a shot in. This was indicative of the difference in quality between the two teams. If a similar ball fell to a Man Utd forward they would be perfectly comfortable controlling the ball and creating an opening. Not that the home teams technical ability had overwhelmed us. On the contrary, we had taken the game to Man Utd and even had the audacity to take the lead! We continued to attack and opened them up when Crouch’s neat footwork created an opening for Jon Walters who forced a save from De Gea. That scare seemed to stir Man Utd into action and they effortlessly stepped up a gear to assert control of the game. They equalised when Robin Van Persie floated over a brilliant cross from the left, Wayne Rooney nipped in between our two centre halves to nod home a leveller. From that stage it was crucial not to be overran and it’s to the credit of our players that we tried to attack and take the pressure off. When Van Persie put us behind on the stroke of half time it was a sickener. Old Trafford isn’t a happy hunting ground for Stoke, simply reaching half time on level terms would be worthy of celebration!! When Welbeck put us 1-3 down immediately after the interval it felt the next 44 and a half minutes could be very long indeed. For a while we were under serious pressure. We were fortunate not to go further behind but managed to stabilise. Michael Kightly’s tenacious run led to us actually getting a goal back and at 2-3 down we dared to dream. We soon woke up though when Rooney scored his third of the game. Had we stayed at 2-3 we may have been able to set up a grandstand finish but we were left with too much to do. Four goals conceded, all from crosses…. Tony Pulis will know what needs work this week. There are several positives to take from the game too. It was great to take the lead, brief though it was, and a refreshing change to try and impose ourselves on the game. The biggest positive from the game is that it’s over and we know we don’t have to go there again this season. Next week we play Sunderland and we’ll all look forward to a game we have a decent chance of winning. We’ve played the top teams and only lost twice. Very commendable, but now we need some points. Much of the British media has focused on Rio Ferdinand’s decision not to wear a T Shirt bearing the slogan of Kick It Out… the anti racism campaign. Ferdinand may feel disillusioned with aspects of the campaign but taking aim at Kick It Out is a misplaced gesture. The administrative bodies of the game have failed to address the issue properly. It has taken a whole year for the John Terry / Anton Ferdinand altercation to reach a conclusion. A year including a bizarre court case, an England manager’s resignation and thousands of column inches. Had the FA taken swift decisive action the message would have been sent out to all those involved in the game that racism won’t be tolerated, as it is the sheer length of the saga suggests they fail to fully recognise the problem. FIFA aren’t really prepared to assert their authority on this subject. During the bidding process for the 2018 World Cup, delegates were even instructed not to take racism into account when voting. last week in Serbia England under 21s Danny Rose was racially abused throughout the game yet FIFA’s response has been conspicuous by it’s absence. UEFA seem much more concerned with pacifying sponsors than dealing with issues of racism. Displaying the emblem of a sponsor’s competitor results in quick action involving hefty financial penalties, in comparison, perpetrators of bigotry remain unscathed. Despite what Alex Ferguson implied after Saturday’s game the issue is much more bigger than his own embarrassment. Ferdinand made his point, a point he’s fully entitled to make. For all that, in the future pressure needs to be applied to the ruling bodies of the game. Despite their vacuous lip service there is little action taken to adequately confront the matter. The A-League currently flourishing. The pivot for the fresh wave of interest is undoubtedly the arrival of marquee signings Alessandro Del Piero and Emile Heskey. While the current boom could be seen as superficial it does justify the huge expense on acquiring the signatures of big drawcard players. Football here still needs publicity to encourage the Australian public to actively support the game. While the marquee players wouldn’t be the right action for every club it’s pleasing to see our game receiving increased TV coverage crowds and media attention. Even the UK news has noticed! http://news.sky.com/story/1000408/breaking-the-rules-footy-wins-favour-in-oz. The subject of Pep Guardiola’s next job remains a topic of speculation. Last week Milan made it clear they would be interested in his services and until he’s appointed somewhere Roberto Di Matteo can be excused for feeling nervous. Guardiola’s ex Brescia team mate Luca Toni has revealed his old friend has asked him about life at Bayern Munich, adding that Pep would be ideal for the job. With Jupp Heynckes reportedly set to retire from Bayern at the end of the season this, may just be the most feasible possibility. One thing is for sure though, until he takes his next role the speculation surrounding his next appointment won’t be fading away. While the draw in Poland is far from disastrous, England returned home with few positives. When we tried to build an attack the forwards were too static. We struggled to keep the ball and the lack of movement led to priceless possession being given away cheaply. England need to learn to move properly and the players need to create options for each other. In the attacking third the play was ad hoc and lacking shape. Joe Hart’s flap led to the Polish equaliser but to blame the keeper alone is to willfully ignore a plethora of issues. When Montenegro beat San Marino next month they will move to the top of the group. In itself it’ll be no calamity for England but when competitive internationals resume in March there will be no more space to drop points. Hopefully in March Jack Wilshere will be able to unlock opposition defences. When fully fit it’ll certainly be time to start building the team around him. He’s showed that he can grow into the play makers role and develop into a top class international midfielder. With such a dearth of English talent his skill mustn’t be wasted. For all that I still expect England to qualify for the 2014 World Cup but Spain and Brazil have nothing to fear from us. Brisbane Roar thrashed Melbourne Victory 5-0 on Saturday. Roar were stylish and won at a canter. At the death Roar forward Besart Berisha hit the bar, a sixth goal would only have given the scoreline a more realistic complexion. As impressive as Brisbane were it’s hard to reflect on the game without pointing out Victory’s hopelessness, and on Saturday Melbourne Victory were utterly, seriously, mind bogglingly hopeless. At best they were indifferent, for large spells of the game they were truly dreadful. Several years after his calamitous spell managing Stoke City, Chris Kamara stated that there were times after games when he’d look at his players in the dressing room knowing some of them simply hadn’t been trying. Ange Postecoglou could be forgiven for feeling the same on Saturday. For Ange’s own sake he must hope that was the problem, if that was an example of this team playing to full potential his task is insurmountable. The issue of who is to host the 2020 European Championship remains a headache for UEFA. Michel Platini’s suggestion that the tournament be played across the continent is far from final and could be refused when the member nations vote in January. The monumental error was to expand the competition to 24 teams. As well as diluting the quality of football on offer it makes staging the tournament much more complicated and much more expensive. The problems finding bidders to host for the 2020 competition suggests UEFA’s number crunchers are oblivious to the current precarious state of the global economy. Another kerfuffle regarding a major tournament is the ongoing discussion over which season of the year the 2022 World Cup will take place in. The debate was offered this contribution last week… “I think sometimes a change is good — it would be great to have it in the winter. Everyone will be fit, physically fit, mentally fit and I don’t see a problem with it. For the fans I think it will be great” A ringing endorsement of a winter World Cup. Who came out with such a passionate justification for winter? A manager? A player? Neither, it was ex Dutch international Ronald De Boer…. who, believe it or not, now works for the Qatari FA!! Do you think he might have an agenda by any chance? Milan manager Massimiliano Allegri’s position looks increasingly precarious. Having only won three games all season, defeat to Inter in last weeks’ derby is hardly inspiring confidence. Last week stories circulated stating that Milan had approached Pep Guardiola to take over from Allegri. This media speculation helps nobody. If Milan want to remove the manager they should sack him, pay off his contract, and move on from there. Allowing the story to be dragged through the media is undignified and disrespectful to all involved. In football possession is 9/10 of the law. So watching games recently it’s flabbergasting to see teams give away priceless possession by conceding so many unnecessary free kicks. Players in their own half, and going nowhere in particular, get carelessly shoved or ankles clipped. It’s utterly baffling that professionals can make these senseless decisions with such monotonous regularity. The principle is TCUP…. Thinking Correctly Under Pressure. Some players need to learn how to make the right decisions during a game. At Anfield on Sunday we defended with characteristic tenacity and our resilience earned us a point. Stoke started the game brightly and took the game to the hosts. Charlie Adam squandered a great chance when he hit the ball at Reina. Goalscoring opportunities at places like Anfield are precious, we really can’t afford to waste them. Liverpool then came into the game and pegged us back. At this stage we entered a phase of the game which casts a dark stain. while we are a physical team that needn’t equate to being a violent team. For a spell in the first half our play became reckless. For a while our game was of a litany of fouls and excessive force. It simply results in free kicks conceded, pressure for our defence to handle and yellow cards. We are an arduous physical side but that side of our game must be kept in check. Thankfully in the second half we settled down and our defensive work was positional disciplined and focused. There were close shaves and near misses but we secured the point in relative comfort. In fact in the final ten minutes we pressed forward and could have stolen victory ourselves. All in all a deserved point. Liverpool will rue some wasted chances but so will we. 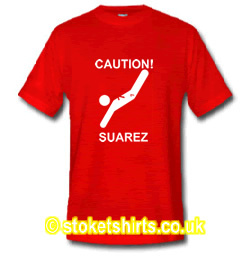 Two points lingering from the game were Robert Huth’s stamp on Luis Suarez and the Uruguayan’s outrageous dive. The FA panel has seen video evidence and Huth won’t be charged by the FA. That is a huge relief but he’s fortunate. It looked avoidable. As masterful as our Berlin Wall is he does carry a risky tendency to err on the dangerous side of the game. Suarez’ dive was hard to actually fathom. It was so blatant he may have even been performing some self mocking parody. Why he chooses to treat fellow professionals with such disrespect is baffling. It has been suggested that it is a form of retribution for off the ball matters and fouls that aren’t given but that’s lame. Lionel Messi also receives physical intimidation but he doesn’t habitually cheat. Suarez shouldn’t need to cheat. In fact, the cheating overshadows the fact that he’s actually oozing with talent. Whatever happened to the Premier League’s ‘marvellous’ 39th game idea? It must filed in the great ideas draw alongside Blatter’s World Cup every two years and Havelange’s bigger goals. A positive result of this ludicrous idea is that the outrage of supporters brought an end to plans for this diabolical bastardisation of football. A shining example of fans using their power as supporters and consumers (sorry for using that C word) to ensure it never got off the ground. Is unpopular change inevitable? If fans can realise their power and influence it is far from inevitable. It’s important to remember that amid talk of TV monies sponsors and billionaire oil oligarchs, supporters still have influence that, if asserted en masse, can change decisions and rattle administrative cages. Anything which effects goings on at football clubs is BIG news. Ensure the way the vast majority of supporters feel… and what is at stake… is on appropriate agendas. Write those letters send those emails ring those phone ins and make a noise…. and abuse of supporter loyalty won’t be inevitable. Much has been made of Joe Hart’s performance against Borussia Dortmund. Impressive though Hart’s heroics were they masked a Manchester City performance that saw them out thought and subsequently outplayed. It’d be reasonable to acknowledge that Man City are newcomers to that stage and this is all part of a learning curve…. if it wasn’t for the sheer cost of Mancini’s squad. Unlike many clubs of greater stature, Mancini has had a bottomless pit of money to invest in the squad as he sees fit. Despite the colossal budget, and a previous year of experience, Man City may struggle to reach the knockout stage of the competition. Given the resources at the manager’s disposal an exit at any stage before the semi final is failure. The players union in Brazil is intending to campaign against the 2014 World Cup schedule. Several matches are to kick off at 1pm which in some of the host cities will mean playing in intense heat and could compromise the health of the players. While it’s hard to believe the plan hasn’t been to satisfy the demands of European television broadcasters, FIFA secretary general Jerome Valcke last week claimed the schedule wasn’t based around financial considerations. The prickly issue of World Cup scheduling has been a bone of contention for many years. As far back as Mexico in 1970 it was clear TV had determined the itinerary. When, before the 1986 World Cup, again in Mexico, Diego Maradona spoke publicly about the dangers of playing in midday heat, it triggered his tempestuous relationship with FIFA. Juggling commercial possibilities with sporting ethics remains a difficult balancing act. Congratulations to Ryan Shawcross on his selection for the England team. It is a deserved accolade for Ryan. If he gets picked in the team he’ll be the first Stoke player to make an England debut since Mark Chamberlain in 1982. In addition his call up is a huge compliment to all at Stoke City and symbolises our current status. These really are great days and we should remember to enjoy them. A few words sum up this brilliant video which has been completed less than 24 hours after Luis Suarez tried to cheat his way to a penalty versus Stoke City. Statistics can be deceptive. Data shows that on Saturday Swansea had 61% possession over Stoke’s 39%. Swansea may have seen more of the ball than us but rarely looked capable of gaining anything from the game. In fact, from the moment Peter Crouch headed us into the lead we were in total control of the game. When Crouch doubled our lead in the 36th minute it sealed the points. To have three points in the bag by half time was a rare luxury for Stoke. Swansea started the second half with more urgency but rarely looked likely to trouble us too much. We weathered the storm and comfortably played the game out. It was slightly disappointing not to score again, we’d have all loved Crouch to grab our first Premier League hat trick, but it was a thoroughly deserved and much needed victory. …. and the statistics can say whatever they like! Our victory was crucial. We hadn’t won since April 7th. The green shoots of our evolution are refreshing but we maintain our status with points. It’s unlikely we’ll get much at all from the next two fixtures, at Anfield and Old Trafford, so it was crucial to deposit points in the bank. Anfield next, the kind of game in recent years in which we’ve seemed unwilling to break forward. With out recent acquisitions and the memory of giving Chelsea a tough game there is no reason not to set up to ensure we impose ourselves on the game. If we emerge defeated it shouldn’t be due to an over cautious approach. The coming weekend will see the start of the most eagerly anticipated A-League season yet. The arrival of Alessandro Del Piero has thrown domestic football in Australia into the spotlight like never before. Since landing here a fortnight ago, Del Piero has behaved with ambassadorial dignity. Exuding charm and humility he’s absorbed the attention with statesmanlike grace. Emile Heskey arrived with considerably less fanfare than the Italian but the Newcastle Jets club shop has sold thousands of shirts bearing his name. So pre season we’ve had some much needed fresh interest in the game. Sydney and Newcastle have the men, but the key question is, do they have the team? Risking accusations of bias, it’s worth remembering that Brisbane Roar are the current champions and will again be a team to fear. The team that has emerged as champions twice in a row has been kept together with the addition of some promising new faces. Losing manager Ange Postecoglou to Melbourne Victory was a blow but the nucleus of the team remains. If Postecoglou’s successor, Rado Vidosic, can maintain the style and grace of recent seasons his promotion could yet prove to be a seamless transition. The big names are exciting and provide a welcome drawcard, but that isn’t the only way forward. Behind the scenes documentary ‘Being Liverpool’ has recently been televised here in Australia. Try though I may it’s hard to see the point behind this programme. It carries little insight and has the aura of a huge PR stunt. The most illuminating discovery from the first episode was the staggering revelation that Steve Gerrard invites his mates round to his house to watch football matches on television. The best fly on the wall look at a football club was Hunter Davies ‘The Glory Game’. The author was granted access to the inner workings of Tottenham Hotspur football club for a season and the results were controversial, enlightening and for many involved deeply embarrassing. Perhaps the most telling fact is that few outsiders have been allowed such free access since. However, if Being Liverpool was produced in book form it’d carry all the cutting edge potency of an IKEA catalogue. One of the weekend’s major surprises was Manchester United’s home defeat to Spurs. It was Spurs first victory at Old Trafford since December 1989. I attended that game many years ago and it was a memorable day for several reasons. It was the game I knew for sure that Paul Gascoigne could become a star and had to be in England’s World Cup squad. Another abiding memory is the anti Alex Ferguson sentiments among the home fans. In the pub pre match there was ongoing fury over Ferguson having been there for ‘four years’ and nothing had improved and sacking the manager was the only course of action. History has proven them all wrong of course, but that perception is all the more baffling when bearing in mind that, at that stage, Ferguson had been there for three years!! Manchester United are a different club and Alex Ferguson is a different manager than on that chilly day nearly 23 years ago, but Saturday’s improved second half performance suggests he’s still got his half time hairdryer! On Sunday one of world football’s most eagerly anticipated fixtures will take place when Real Madrid face Barcelona at the Nou Camp. From Santiago to Tokyo, hundreds of millions throughout the world will tune in….. but not in Australia. ESPN televised the Spanish league in recent years but the increased cost of broadcast rights have led to La Liga being dropped from the station’s schedule. In consequence, for the first time in many years, this compelling war of footballing attrition won’t be shown here. The sun will continue to rise, the earth will continue to spin, but it’s a sad loss to the Australian football menu. In the League Cup tie last week Nicolas Yennaris played for Arsenal against Coventry. As unremarkable as that may seem there was a quirky aside involved. The last time Arsenal hosted Coventry in 2000, Nicolas Yennaris was the mascot!